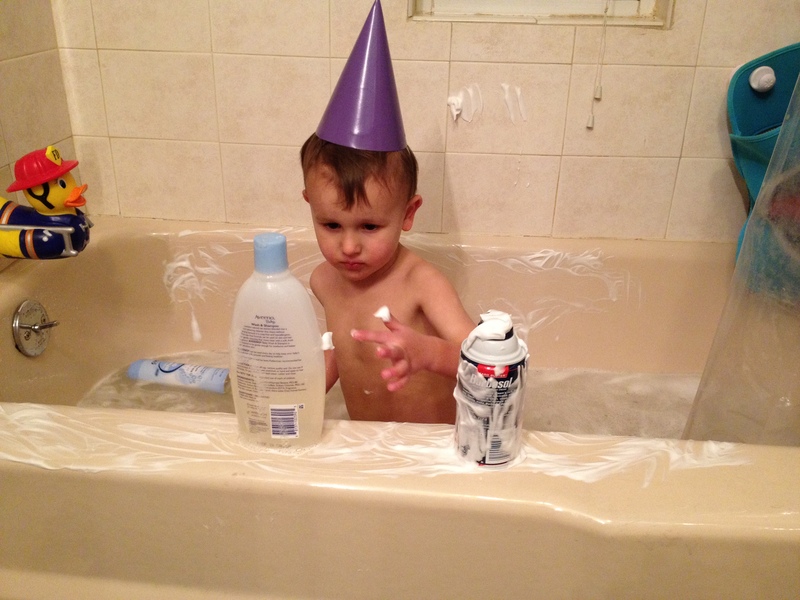 A girl only turns thirty once, and Saturday was my sister’s go at it. We did what any good family would do; we went to Vegas. Hilary, Hunter, Tom, Justin, and me. We took Vegas by storm, blowing in on Friday night just in time for a dinner at Battista’s (unlimited wine, anyone) and then making our way over to The Mirage for Cirque de Soleil. I wish I could tell you that I was awesome and stayed up for the whole thing. But, well, it wasn’t my thirtieth birthday. The show was amazing; I’ve never seen anything like it in my life. And the bed. Oh, the bed. We all stayed at The Bellagio, and Justin and I wound up with the luxury of a room with two queen beds. You know exactly what we did, right? Slept. In. Separate. Beds. It was bliss. Luxurious pillows and so much space all to myself. I slept right in the middle for eight solid hours. Few things in life are more perfect than that. Saturday, Hilary’s birthday, started out with a fabulous brunch buffet. With unlimited mimosas. We watched the Kentucky game from our own private alcove at the Palazzo Sports Book. We walked through The Wynn and Caesar’s Palace. Hunter and Justin went to shoot guns. Hilary and I found another way to occupy ourselves. Are you familiar with a little show called Pawn Stars? We love it at our house. Since we’d flown across the country, we figured it was only fitting to take a little drive down the strip to get there. I have to be honest; it was a little disappointing. However, since I’d read all sorts of disappointing reviews online, I was pretty well prepared. Fortunately, we didn’t have to wait in line. We were able to just go right in. And there it was. The World Famous Gold and Silver Pawn Shop. In all its… Well, all it’s pawn-ness. It was pretty much your run-of-the-mill pawn shop, with a third of it dedicated to show memorabilia. I found the cheap jewelry section and bought a pair of $20 earrings. How could I not? After the pawn shop, Justin and I took a little field trip to the Allure Wedding Chapel in the middle of sketchy 3rd Street to renew our vows. I know, I know. But there were two things I wanted to do in Vegas. One of them was go to the pawn shop. The other was get married. Justin just seemed to be the logical choice. As corny and hokey as it was, I loved it. Actually, it wasn’t quite corny enough. I did get a fake bouquet of flowers. There’s a DVD and picture selection on it’s way in the mail. And, while we didn’t get married by Elvis, we did get married by Minister David. He was dressed for the event in a t-shirt, jeans, and a too-short high school graduation gown. After he told Justin to kiss the bride, he announced, “Live, from Las Vegas, I’m pleased to introduce Mr. and Mrs. Justin Manna!” Love. It. We hopped in a cab and were whisked – well, slowly driven through traffic – back to Paris for dinner at the Eiffel Tower Restaurant. Hilary wanted to celebrate her birthday in Paris, and this was as close as we could get. It was a swanky place, and Tom managed to get our table moved to one in front of the window. We were able to watch the Bellagio water show while we ate. Justin thought he and Robbie were ready to leave for daycare yesterday when Robbie turned around and ran back into his room. He stuck his hands through the slats of his crib, rooted around, and found them. Mickey and Pluto. Because of course they would need to go to daycare with him. They are best friends, after all. Then, downstairs, Justin had to wait a moment while Robbie juggled his buddies in order to grab his Mickey balloon. Justin put a Go Cats hat on Robbie’s head and they were off. I can only imagine how disappointed Robbie was when he rolled into daycare. 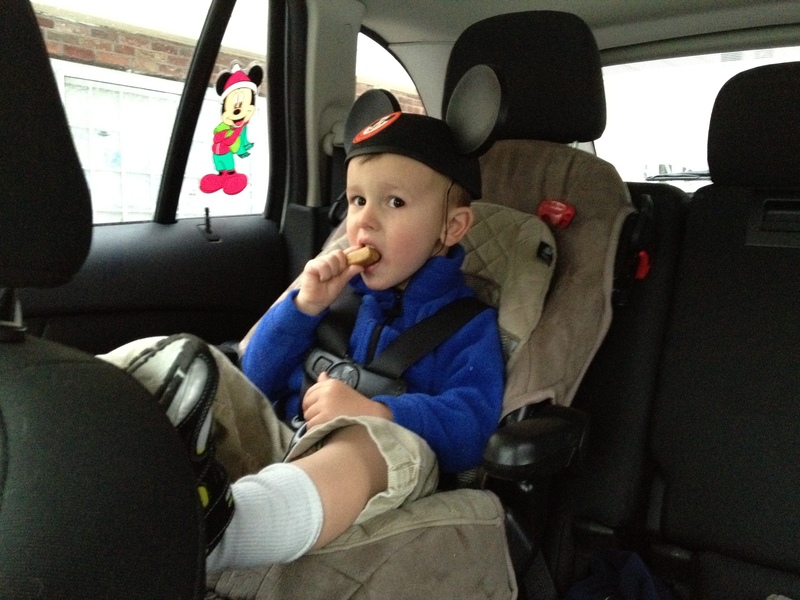 Fortunately, his enthusiasm was quickly revived when I picked him up and put his Mickey ears on for the ride home. It’s nice to have a little magic on a Monday. So, we are going through a phase. 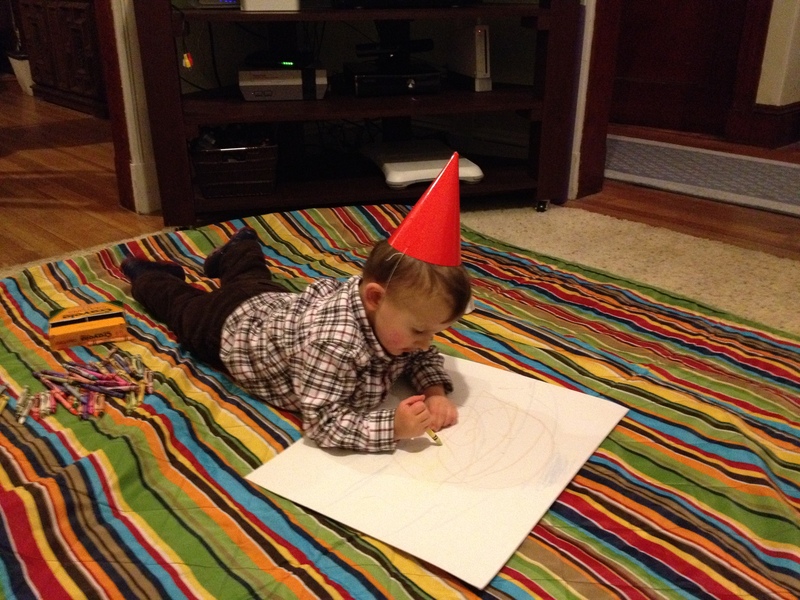 And it involves Happy Birthday Party Hats. They have been everywhere with us over the past four days. One of them managed to survive the bath tub and a fair amount of the night in his crib. They also make for good thinking caps when it comes to coloring. Or trying to look like David the Gnome. Everywhere we went on Sunday, Robbie was wearing a bright green party hat. With the exception of church; I somehow convinced him to leave it in the car, although he was sure that Baby Jesus would be OK with it. And, everywhere we went, people asked me if it was Robbie’s birthday. He adjusted well to the extra six inches on top of his head, ducking down to make it through the short doors at the mall play area. He politely set it aside when getting his hair cut. He did not, however, politely get his hair cut. That involved a lot of kicking and screaming. So, Justin and I need to start watching our language. Immediately. Like yesterday. Robbie and I went to the movies Thursday to see Chipwrecked. I know, not an award-winner, but it was a good Robbie-friendly option. Unfortunately, Robbie was more in a PG-13 mood. I stopped at the concession stand to buy popcorn and drinks before going into the movie. Robbie, sensing that we were late, said, “Damn it! Popcorn, Mom. Damn it!” I could see the kids behind the counter exchange smiles as my child continued his string of expletives. Meanwhile, I did my best to hide my own while trying to correct Robbie’s language. We’ve been working on alternatives. “Oops!” “Dang it!” And, much to Justin’s horror, “My B!” But, even still, “damn it!” keeps slipping out of his mouth. But, at least he’s using it appropriately. And not dropping the f bomb. But stay tuned, that’s entirely likely in the next week. It’s an interesting thing, coming out of the fog of a family tragedy. I could feel myself start to come out late last week, and this week things are starting to feel more normal. I went running twice this week. I’ve been singing a little more in the car. But it’s strange, realizing that other people went on living their lives and even interacting with me while I simply floated from day to day, unable to focus. Occasionally, I run into someone I don’t even remember that I know. It happened last week in church. I saw a friend I only see in church and hadn’t seen for almost two months. I was supposed to call her right after Thanksgiving to get our kids together to play… Or the friend to whom I was talking earlier this week and said, “Did you know my mother-in-law had passed away?” when he asked what was going on. Turns out, he had sent his condolences. Which I know meant a lot to me when he sent them, as I read every single message – text, Facebook, or otherwise – and listened to every voicemail. It’s all so overwhelming, and you do your best to focus from the time you wake up until the time you can leave work. And when you get home, you function just enough to get your child fed, bathed, and turn on Christmas movies until we all fell asleep together. Sadly, this becomes a habit very quickly, for everyone involved. And so here we are, some of the pieces picked up and getting a few more of them in order every day. After all, that’s the only option, right? I have no idea where he comes up with this stuff. Instead, Robbie turned to look at me and said, “Nah, Mom. QiQi go work in Boston.” And then headed down the stairs. What? Where in the world did he get that? To add to it, when we got outside, I headed to the car to put the bags in. When I was finished, I turned to tell Robbie to hurry up. He said, “See ya, Mom. Go work in Boston. Bye!” And took off down the street – ironically, toward Boston. It kept coming tonight at bed time. Robbie stood up on his changing table and jumped into my arms (at some point I expect this to stop being such a surprise, and Robbie fails to understand that it can be dangerous if the person is not paying attention…). As I caught him, he yelled, “Good jumper, Mom!” Then, as he gave me a big hug, he congratulated me, saying, “Good catch, Mom.” And I laughed, because I think it was a very good catch, too. It was bound to happen. In the past nine-and-a-half years, Justin and I have driven thousands of miles. First back and forth from Kentucky to Georgia to see each other – 475 miles each way. Then to see our parents. Then 1000 miles to Kentucky from Boston to see family. Justin got pulled over once for speeding but got out of the ticket. I wound up on the side of the road once when I ran over semi tire tread. But that’s it. There we were, air drumming our way home from a friend’s house. Listening to my running mix. I saw the light turn yellow. I knew I should have stopped. But, well, I didn’t. A split second later I saw them. Blue lights. Flashing just for me. And there we have it. The first time I have been pulled over in fourteen years. And the dear, sweet officer was doing a whole lot of writing. Surely too much writing to just give a warning. Probably $150 worth of warning. And there you have it. My perfect driving record still in tact and a little reminder to slow down. That lesson was hammered home a mile down the road where I came across a pedestrian/car accident that had just happened. And I have to wonder, would that have been me hitting the pedestrian if I hadn’t been forced to slow down? I actually think I’m going to frame my warning. After all, who doesn’t need a visual reminder to slow down. My house has been driving me crazy. For months. Possibly years. We have minimal closet space. Actually, for New England it’s pretty decent. For anywhere else in the world, it’s abysmal. We have too much stuff. It’s a terrible combination. 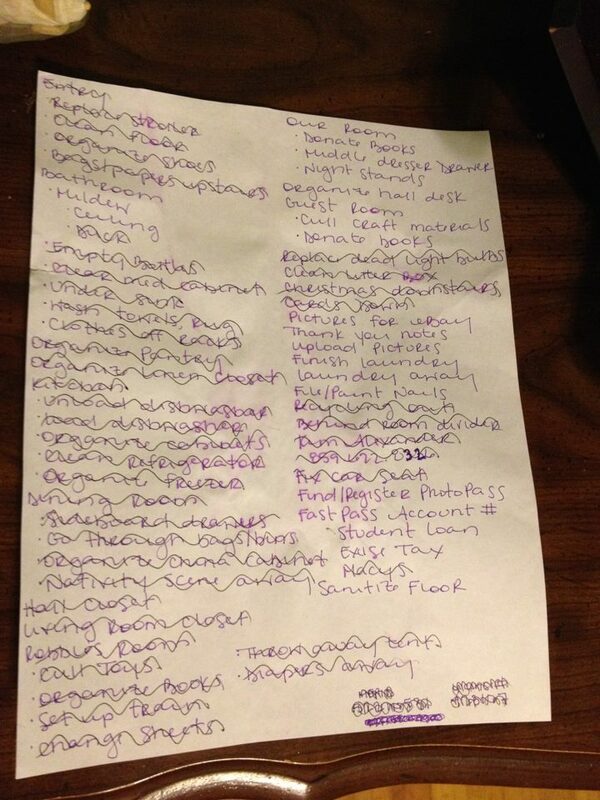 And so, to celebrate our only our third weekend home together in the past ten weeks, I created this to do list. It took two and a half days, but we did it. I sorted through every single closet, drawer, and cabinet in the house. Well, except for the guest room/Justin’s office and the basement. But what do you expect? Total perfection? 1. It is best to keep all of a particular item in one place. For example, batteries, Scotch tape, tubes of toothpaste, and hair brushes. We have approximately 65 never-used batteries (AA, AAA, C, and D – we have them all), 7 rolls of tape, 6 tubes of toothpaste (3 unopened), and 5 hairbrushes. By having them all in one place, you will not continue to purchase, purchase, purchase. And you’ll actually be able to find them at midnight when you just have to change the channel. 2. Tupperware takes up a lot less room when you actually use it and it isn’t just stacked haphazardly in your pantry. 3. Junk mail should be shredded as it enters the house. There is no good reason to have boxes of “to shred” papers three years old. But, we do. And probably always will. 4. This cannot be done (or cannot be done well/without major panic attack) without a competent partner in crime. Fortunately, I happen to have one of these. He (very willingly) completed all of the out-of-the-house errands; took care of Robbie (how many times can you watch the Toy Story trilogy? ); sorted through all of our DVDs, video games, and CDs; washed, folded, and put away all the laundry; and even brought me coffee each morning. 5. Have one junk drawer in the house. There is no way you are actually going to have a place for everything. It’s just not possible, so don’t try. But make sure that only the most important junk goes there. 6. PUT YOUR THINGS AWAY! You don’t want to have gone through all this clean out for nothing. You don’t want all your work to be undone in two weeks. So, remember how hard you worked and put that glass in the dishwasher, those socks in the hamper, and those groceries in the pantry. Are you ready? Totally inspired to get your house organized? Don’t worry, I’m not taking it personally. There’s always next weekend. 3:05 in the morning. That was when the alarm went off on Saturday morning. And, yes, it was set that early on purpose. Perhaps because Justin and I had lost our minds. Actually, I’m sure that’s what it was. 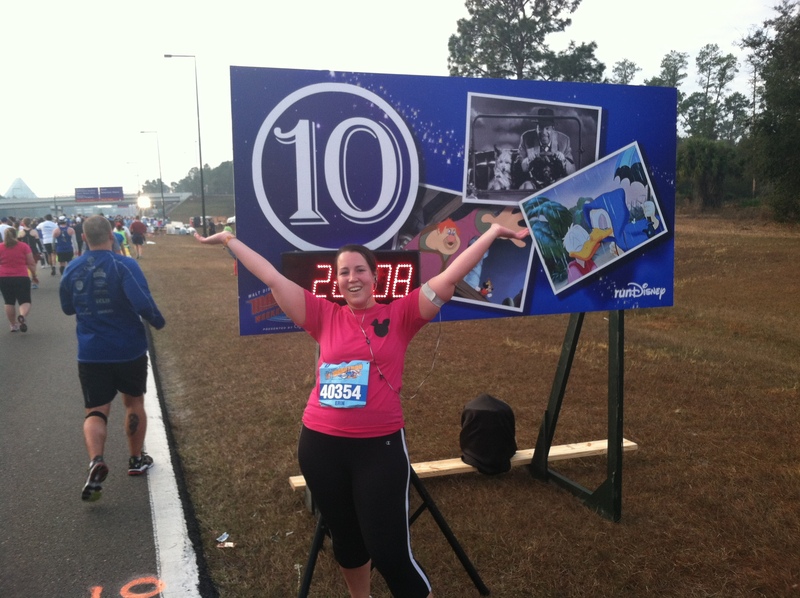 We were running the Disney World Half Marathon. That was actually the entire reason we were at Disney World; Justin had promised his mom that he would run again for her. And, after all that had gone on, how could he not run? How could we not run? And so, despite our lack of training, sleep, and anything resembling energy, we were on a bus to Epcot to run 13.1 miles. In matching shirts I had made. Pink, for Augusta. Justin’s says, “I love you, Mom” on the back. Mine says, “This one is for Grandmama”. She would have loved them. 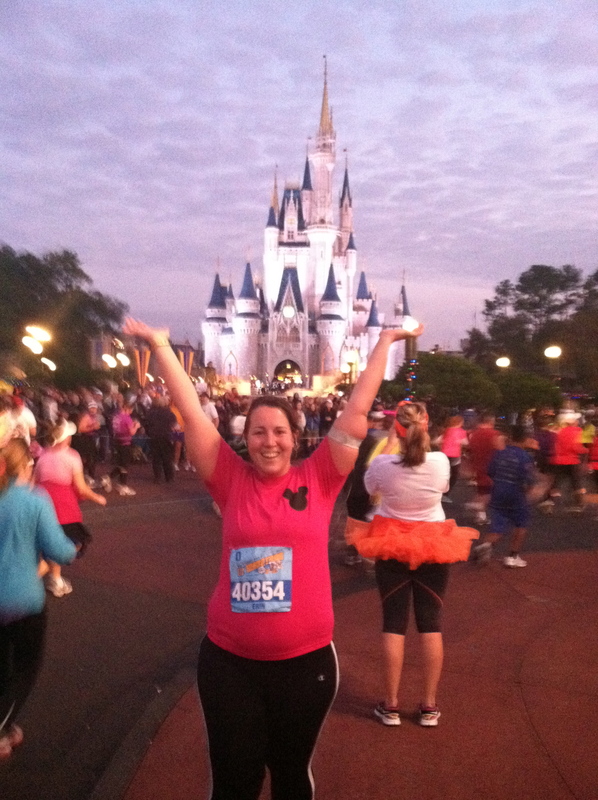 Disney knows how to throw a race; I’ve never seen anything like it. Eight corrals of people. 27,000 of our closest friends. Fireworks in the middle of the night. OK, OK. Fireworks at 5:30 in the morning. Might as well have been the middle of the night. Each corral got it’s own firework start, which was pretty fabulous. All of a sudden, we were off and there was no turning back. Only 13.1 miles between us and relative rest (there was a two-year-old resting up at the hotel with an overpaid babysitter just waiting for us to show him more fun). This race was like nothing I’ve ever seen before. High school marching bands and cheerleaders were scattered throughout the course, playing and cheering us on. There was a tethered hot air balloon. Disney characters every mile or so. Oh, and the two parks. 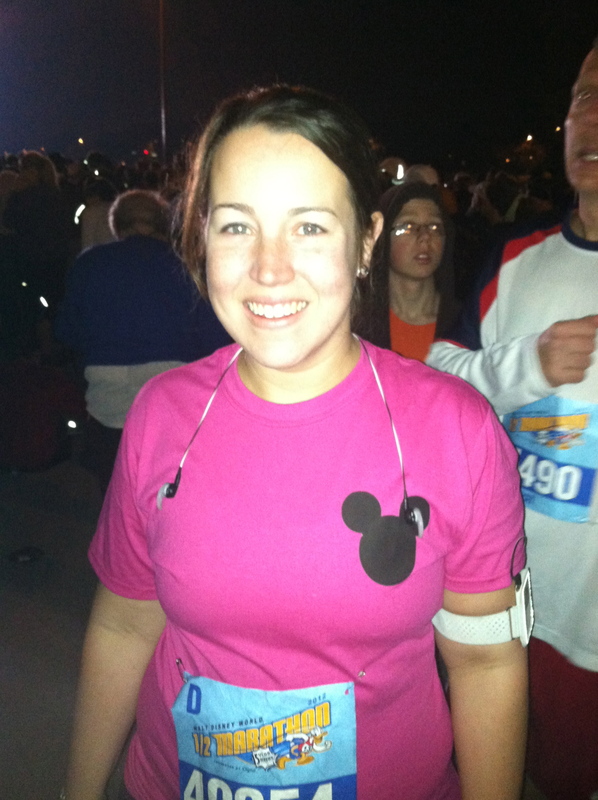 The race started just outside of Epcot and ran all the way to the Magic Kingdom. And I do mean all. the. way. Just because you see signs that say “Magic Kingdom, Left Lane” does not mean you are close. They took us the long way – through the main parking gates, through two or three miles of parking lots. And then, finally, we were there. Running down Main Street. And through Tomorrowland – Buzz posing for pictures right next to us. Around Fantasyland. Through the castle. Down a lovely street filled with the aroma of freshly baked cinnamon rolls. And then back onto the main street again. It was fun until Mile 8. And then, all of a sudden, the race was horrible. Mile 9 should have brought some relief. The gel from the Clif Bar stop at 8.6 miles should have kicked in, but all I could think was that I still had four freaking miles left to run. But I held it together pretty well until Mile 10 when Justin kindly said, “Well, we just have a 5K left. That’s all.” I wanted to punch him. Instead, I posed for a picture. Somehow, by the grace of God, Justin and I managed to cross the finish line. We were slow, but we ran almost the whole thing (probably 12.8 miles) and finished without major injury. And I know how thrilled Augusta would have been to watch us cross that finish line, hands raised over our heads.